If you miss saigon you will be pleased to know that this much loved show is returning to London in May 2014. 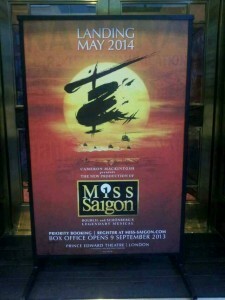 It’s almost 25 years since Miss Saigon premièred at the Theatre Royal, Drury Lane, where it became the longest running show at this renowned theatre, and it went on to become a phenomenal success all over the world. It’s the show that Cameron Mackintosh has had the most requests to bring back and for many people it is their all time favourite show. The show will open at the Prince Edward Theatre, London and will be directed by Laurence Connor with musical staging by Bob Avian. The production design is by Totie Driver and Matt Kinley from an original concept by Adrian Vaux. Claude-Michel and Alain Boublil have written a powerful new song called ‘Maybe’ for Ellen to sing in the second act at that point when she has just met Kim. The song has been included in the recent Dutch and Japanese productions and while it has never yet been heard in an English production of the show those lucky enough to have been to the American/Canadian tour of the Boublil and Schonberg concert ‘Do You Hear The People Sing’ will have been able to enjoy the song in English. The show will again be orchestrated by the wonderful William David Brohn. The highly acclaimed original London cast included Jonathan Pryce as the Engineer and Lea Salonga and Simon Bowman as the star crossed lovers. Casting for this new production is eagerly anticipated! Tickets go on sale on 9 September 2013.